Ah, yes. Russell “The Roadrunner” Westbrook of the Oklahoma City Thunder. I gave the uniquely electric Orange Roundball League point guard this nickname a few years ago. Simply put, when he has the orange in hand, it’s a waking nightmare for any defender in the league. Beep, beep. Russ may very well have the quickest fast-twitch muscle fibers the NBA has ever witnessed. If you don’t know anything about muscle fibers, the fast-twitch ones work together to create explosiveness within the human body. He can go baseline to baseline with the rock in 1.3 seconds. Okay, I’m just joking. Still, that probably isn’t that much of a stretch for Mr. Westbrook. He’s lightning in a bottle. The lightning bolt before the thunder. I’m talking about the lightning bolt that hits your neighbors’ backyard tree electric. That’s correct, he’s a scary sight to see dribbling the basketball with his foot on the proverbial gas pedal. Listed at 6-foot-3 and 200 pounds, Westbrook is in my opinion without a doubt the most eruptive guard in the NBA today. Maybe ever. The 30-year-old from Long Beach, California is a machine, folks. Russ is an eight-time NBA All-Star that just so happens, as I’ve said before, to gobble up triple-doubles like Tic Tacs. That being said, I truly believe that The Roadrunner has extraordinarily fresh breath. On Tuesday night, OKC hosted the beleaguered Los Angeles Lakers at Chesapeake Energy Arena in Oklahoma City. Russ went ahead and had himself a 20-20-20 night. Are you kidding me? Well, no. Westbrook finished the evening with 20 points, 20 rebounds, and 21 assists. Wow. The Thunder finished off the Lakers, 119-103. Russ dedicated his otherworldly performance to his friend and rapper, Nipsey Hussle. Sadly, Nipsey was shot and killed in Los Angeles on Sunday outside of his Hyde Park clothing store. R.I.P. Nipsey Hussle. Westbrook is only the second player in Orange Roundball League history to post such a game. The only other time we’ve seen a 20-20-20 game, you have to trace your steps back to the magnificent Wilt Chamberlain in 1968. As I like to say — goodness, gracious. As of Wednesday afternoon, the Thunder (45-33) are locked into a playoff spot out West. Oklahoma City, currently the No. 8-seed in the Western Conference, would have a tall order facing the defending back-to-back NBA champion Golden State Warriors in the first round of the 2019 playoffs. However, the Warriors don’t own the rights to Mr. Westbrook. With less than a handful of regular-season games remaining, OKC has the opportunity to push past the San Antonio Spurs at the No. 7-spot in the West, and potentially catch the Los Angeles Clippers for the No. 6-seed. Nonetheless, Russell “The Roadrunner” Westbrook’s OKC Thunder are playoff bound. 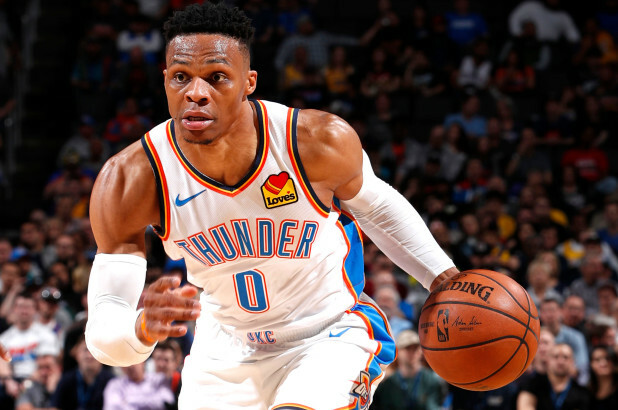 If Russ can push the pace while scoring, snaring rebounds, and serving up a variety of delicious dishes to his mates as he has done the entire season, the Thunder will have a formidable chance at a first round upset. Enjoyed this article about “The Roadrunner” (aka Russell Westbrook)! I have heard of players having double doubles before but to hear that The Roadrunner had a triple double (20 points, 20 rebounds, and 21 assists) is almost unbelievable. Keep up your great work. Expecting that you will soon begin getting paid for your great work!